The move follows the approval of the examiner’s scheme in court today. 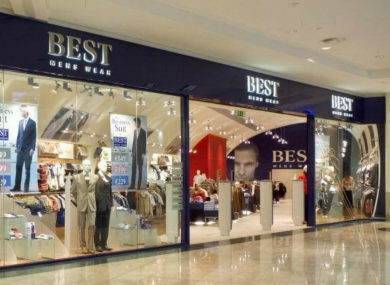 BEST MENSWEAR, WHICH employs over 130 people, will exit examinership on Friday. The company went into examinership in July, as part of the fallout from the closure of Clerys. Best was one of a number of concessionaires in Clerys who are owed between €1.5 million and €2 million by OCS Operations Ltd, which ran the department store. They say that the closure of Clerys put an enormous strain on cashflow, compounding the company’s trading difficulties and ultimately led to the decision to seek the appointment of the examiner. Almost all Best Menswear stores will continue to trade, including stores in Arklow, Blanchardstown, Drogheda, Dundrum, Liffey Valley, Mahon Point, Newbridge, Santry, Stephens Green, Stillorgan and Swords. There is no indication as yet which stores will close. Best was established in 1948 and is one of Ireland’s oldest menswear retailers. David Jones, Managing Director of Best said the company was aiming to continue to trade. We are delighted to be set to successfully exit examinership on Friday. The process has facilitated Best Menswear reaching agreements with our creditors and, together with the adoption of a range of cost control measures, we now look forward to a bright future. As a direct result of this process, 130 jobs in Best Menswear stores have been saved. Email “Over 130 jobs, and one of Ireland's best-known brands, have been saved”. Feedback on “Over 130 jobs, and one of Ireland's best-known brands, have been saved”.